Should I rent a Bagster® or Dumpster? There is a fee associated with purchasing the Bagster® as well as an additional fee when the item needs to be picked up. Please note there are some cities not covered in the service area for pick up. Items such as electronics and appliances are not permitted in a Bagster® per their website. A recent review from a customer who purchased a Bagster®, "We purchased a Bagster to throw away unwanted items after a move but quickly realized it wasn't big enough. I called James who was very nice and explained the sizes and costs of the dumpsters. After deciding on a 15 yard dumpster he set it up and it was delivered the next morning. They even used their truck to lift our FULL Bagster into the dumpster which saved us a lot of time and effort. The entire process was very smooth and professional. I highly recommend." See more reviews on our website! There are pros and cons to both methods of disposing waste. We recommend to consult your local dumpster provider to see which option will be the most convenient and cost effective for your particular disposal needs. Where Can a Dumpster Be Placed? One of the first questions we receive once a homeowner decides they need a dumpster is where to place it on their property. Should it go in the driveway, in the yard or around back through the alley? Dumpsters can be placed in a variety of areas and most often are placed in the area that’s most convenient for you the homeowner. We invite you to take a look at our dumpster placement page to see photos of different areas where dumpsters have been placed! If your cleaning out the garage well the answer is easy we will place the dumpster as close to the garage as possible. If your hauling items out the front door we will angle the dumpster so you have the shortest distance to walk. If your tearing down a shed out back you will want the dumpster closest to that area. In a perfect world we always try and place the dumpster on a solid surface such as a paved or gravel driveway. This ensures despite a heavy rain or snow covered ground the dumpster wont move or sink into the surface. Back yard by the barn? Sure we can! This isn’t always possible because of narrow single driveway or low power lines so when the need arises a dumpster can be placed on grass or a dirt surface. Please be aware however this is not ideal situation as mentioned above. If there is a heavy rain or soft ground the dumpster could sink into the surface causing ruts or an uneven surface. To better serve our valued customers Bin There Dump That Indianapolis offers a 100% driveway protection guarantee from scrapes or marks when we place the dumpster on a solid surface. Our unique roll off and board system allows for peace of mind to our valued customers. One thing to keep in mind however is a dumpster can’t be placed in the street without a permit. The city of Indianapolis and many of the surrounding communities require a specific permit to place a dumpster on the street. Be sure to check with your local government if a permit is needed where you live. At the end of the day the dumpster rental company wants to make sure the dumpster you order is properly placed and in a convenient location. When ordering the dumpster discuss the options with the company and mutually decide the best and safest dumpster position for everyone! Give us a call today at 317-590-1973 and we will be more than happy to discuss dumpster placement with you! Hello Indianapolis, here’s your chance to give back to the community and enjoy a fun day at the historic Indianapolis Motor Speedway with your friends at Bin There Dump That Indianapolis for Mutt Strut 2015! Mark your calendars for Saturday, April 25th as we walk around the historic 2.5-mile oval for our four legged furry friends! That’s right all this to benefit our friends at the Indy Humane Society! Grab your sneakers, your dog and let’s plan on a fun filled Mutt Strut kind of day! Registration is easy simply go to the Bin There Dump That Indianapolis website to sign up for the fun! Registration is just $30 with 100% of the proceeds going straight to the Indy Humane Society! This fun filled day will not only be rewarding for you as your giving back to charity but also an exciting day for your precious pet as he or she will be surrounded by thousands of their furry friends! Join Team Bin There Dump That as we give back to the community and the fine folks at the Indy Humane Society for a fun filled day at the historic Indianapolis Motor Speedway! Moving and need a Dumpster? Moving to or from Indianapolis in the near future? Have you thought of renting a dumpster? When moving you may need a dumpster more than you think! We often deliver dumpsters where there is a moving truck on one side of the driveway and a dumpster on the other! Why take items you don’t want, moving is a perfect time to get rid of junk and old items you haven’t used in years! While packing items up for the move decide if you will need them in the new house? Ask yourself the question, have I used this particular item lately? Does the item still work? Where will we place the item in the new house? These home owners chose a 15-yard dumpster for their move. Perhaps your downsizing and don’t have room in the new house? Renting a dumpster while moving in this scenario makes perfect sense! Take the items you need and will use and utilize the dumpster to get rid of the clutter! Customers call us all the time, who, are in the process of moving. Perhaps it’s across town or across country. Often times they don’t realize how much junk they have accumulated in their house over the years and only have so much room in their moving truck! A dumpster rental could ease your burden and decision making, allowing you to take the items you need and not the junk you don’t! So if a move is in your future compose a pre move checklist, decide what you will take, what you can donate to friends and family and what items are junk, and need to be disposed of! Pick the size of the dumpster needed depending on the amount and size of items your disposing of. In the end you will be much happier when moving into your new home and renting a dumpster will help de-clutter your move! Below we have listed some of the top moving companies in Indianapolis! When your ready to make the move and start a new chapter in your life give us a call at 317-590-1973 or email and we will be more than happy to help you remove the unwanted items and junk! Do Items put in the Dumpster Get Recycled? We get this question asked to us all the time, do the items that I throw in the dumpster get recycled? As a family owned and operated business located in Indianapolis with a young son of our own we are very conscious about the environment and recycle whenever the opportunity presents itself. The one thing to keep in mind is not all items can be recycled and what can be recycled will often vary from not only state to state but also city to city. Here in Indianapolis there are 3 major items that we recycle on a regular basis. The first item, which we can recycle and may seem odd to some, are shingles. How many of you plan on getting a new roof or have had your roof replaced in the last 5 years? Did you know that the shingles from your roof could be part of the pavement you drove on to go to work today? Nearly all of the shingles that we collect through out the year are recycled and are reused. The second item we recycle on a regular basis are trees, limbs, shrubs and grass. Did you know that the tree in your backyard that was struck by lightening could be used as mulch in your flower garden? We work closely with several local landscaping companies to recycle clean yard waste into reusable items for your home. Please keep in mind no trash can be mixed in with the yard waste and must be 100% clean of any miscellaneous debris. Bricks can be repurposed for many home uses! The final item, which can be recycled is concrete and brick. Do you have any plans to tear down that old chimney or fire pit? Perhaps your breaking up the concrete patio and replacing it with a wood deck? 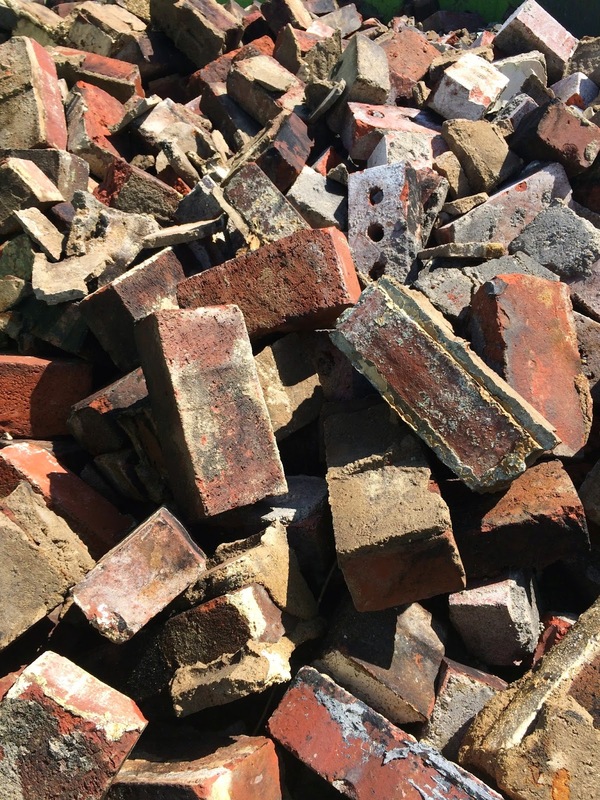 Both concrete and brick are great items that can be reused for a second time. Perhaps when its time to build a new fire pit of flower garden wall, think about using recycled brick! The one key to remember though that it must be clean, meaning no paint of any sort on the concrete or brick in order for it to be recycled. We take great pride in keeping Indianapolis clean and recycling when ever we can! We ask that you do your part whenever possible. If you have any questions on what other items may be recycled feel free to give us a call, 317-590-1973.